Gerry Wedd, Kitchen Man (after The Reels), 2019. 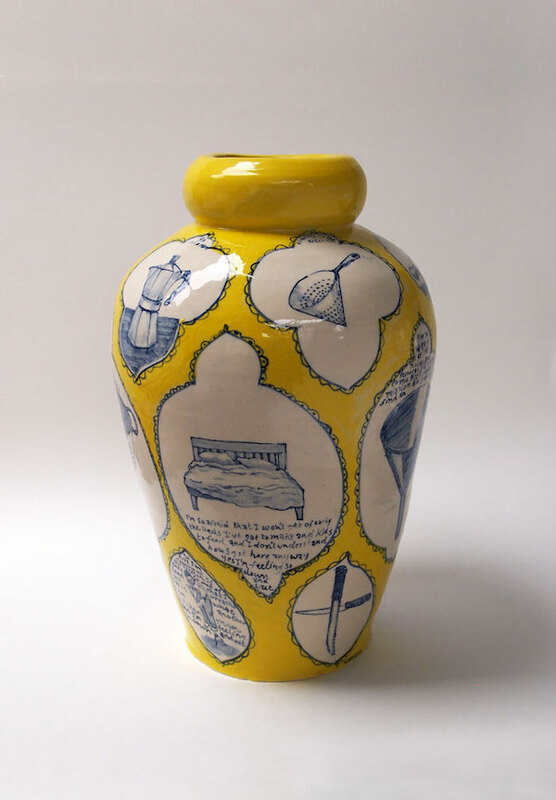 Glazed ceramic, cobalt underglaze, slip, 35 x 21cm. Courtesy: the artist and Hugo Michell Gallery, Adelaide. Gerry Wedd is a South Australian artist known for his ceramics as well as his long-term contribution to the iconic Mambo brand, beginning in the late ’80s and ending in 2006. Wry and witty, his classical ceramic forms draw on surf culture, politics, and cult music in their surface decoration. In Pot Songs, Wedd presents a series of ceramic works he views as fan art, or suburban folk art, in that they are homages to their subjects. Wedd sees the works as covers – as tributes of a sort, but more importantly, as reinterpretations, that, like musical covers, focus on the lyric content, melodic aspect, or rhythm of the original. Wedd pays homage to the sources of the images, text, and lyrics that adorn his vessels, but also pays homage to the canon of his chosen medium, as he engages with and subverts its traditions.